"Throughout the whole holiday, we kept pinching ourselves because it was almost too good to be true!" They travelled with Exoticca in October of 2018. We’ve always really looked forward to our holidays. When the children were younger we used to organise lovely family holidays all over Europe and to the States, but in recent years my husband and I have often opted for luxury cruises as a way to see more of the world. We’re active and have more time these days, so the idea of a tour suited us. Although my husband loves the beach and relaxing in the sun, I’m not much of a sun-bather so when we saw this trip, combining a cultural tour of Sri Lanka with a luxurious beach stay in the Maldives, a destination my husband has always wanted to visit, it ticked all of our boxes! We saw the holiday online and booked last minute and although we hadn’t heard of Exoticca before, we saw that their trips were ATOL protected so went ahead and booked, looking forward to a new experience in a part of the world we had yet to visit. I made sure to read some guidebooks and do my research before setting off on our trip. I wanted to learn as much as I could beforehand, especially as we had never been to Asia before. I expected Sri Lanka to have a very different culture to anywhere else we had visited in the past, which was part of the appeal and of course, the Maldives was a treat that we were really looking forward to, especially as we were booked into one of those coveted over-the-water villas! I had imagined that our tour would be taken in a minibus, with other travellers, so you can imagine my delight when we arrived and found it would just be us with our driver and guide Udana for the whole trip! We flew into Colombo, the capital of Sri Lanka, and the city was truly above and beyond our expectations. It certainly showed us another side of life, and was overwhelming in how chaotic it was, with a constant flow of humanity coming at you from all directions! I simply couldn’t stop looking out of the window of the car as there was so much going on and so much to see. touch. Udana happily helped us choose extra things to do outside of the itinerary and really helped to create a tailor-made experience, which was something we didn’t expect, but thoroughly enjoyed. 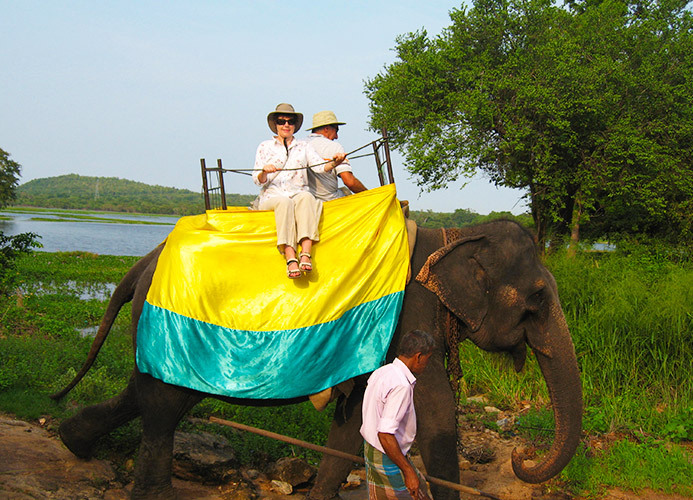 Sri Lanka is bursting with wonderful sights and sounds, and the places we visited were all unique and offered many different insights into the country’s culture. Each day was different. We loved climbing up the Sigiriya Rock Fortress in particular and really packed in a lot to that morning to make the most of the cooler weather earlier in the day. We awoke early and went on an elephant ride, an experience that I will treasure as I doubt I’ll ever get to do it again, before climbing up the 1,200 steps to the top of the ancient rock fortress! In Kandy, I loved the visit to the Temple of the Sacred Tooth Relic, which contains a relic of Buddha’s tooth and offered a fascinating insight into Buddhist religion. It was quite busy, with both locals and tourists, but it was clear how special the site was to the believers. I feel like we had a unique experience of Sri Lanka, as our guide was willing to take us off the beaten path to explore lesser-known sights. We visited the Buduruvagala temple, a 1000-year-old Buddhist site with amazing rock-carved buddhas which is definitely worth the visit and relatively unknown so it was very quiet and peaceful. We even managed to fit in a relaxing massage at a retreat in Sri Lanka, the first massage my husband had ever had, which was a lovely way to unwind from all the busy travelling. Another highlight was the Minneriya National Park, where we saw hundreds and hundreds of elephants in the wild. We had already seen the elephants in the orphanage but watching them close-up in the wild, especially the mums and their baby elephants, was a special experience where you could admire the beauty of these animals. We couldn't believe it when we could see elephants from our balcony at Centuria Wild hotel! 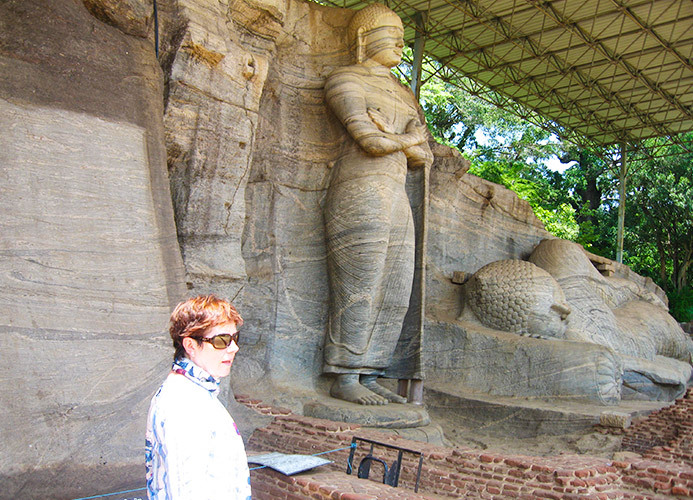 Sri Lanka really opened my eyes to Buddhism and to how important it is to the culture of the country. The Sri Lankans are very respectful people and I loved seeing the dedicated Buddhist monks, clothed in their orange gowns. Our guide told us about how many young men become apprentices to the monks, who provide them with an education and give them opportunities they might not ordinarily have access to. I found the whole country, especially outside of the cities, to be a very calming place, which values its culture and traditions. I also noticed how there is a big divide between the rich and the poor. We were lucky enough to stay in spectacular hotels, which contrasted with the poverty we saw whilst driving through some of the more rural areas. After our amazing tour of Sri Lanka, we took a flight to Male, the capital of the Maldives. From Male we took another short flight to a tiny island, although it was now nightfall so we couldn’t see much. 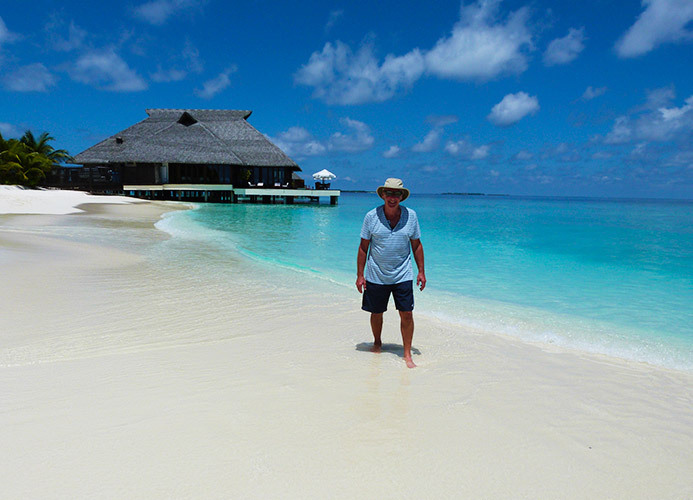 Next, a speedboat picked us up from the dock and we felt very swish speeding along the ocean towards our paradise atoll! Once we had docked, our butler met us and took us to our villa. As the sun came up the next morning it was like being in a dream. We had an over-the-water villa, and looking out across the turquoise waters, full of colourful fish, we knew we were in for an unforgettable few days in the Maldives. We loved all the facilities and spent our days swimming in the beautiful ocean, relaxing on the white-sandy beach and dining in the beautiful restaurants. It is a very romantic place and we are glad we opted for the luxury water villa as it was worth it for the experience it gave us and for the special extras we enjoyed, such as massages and luxury dining experiences. We loved drinking the tropical cocktails and watching the unbelievable landscape as the sun went down. Throughout the whole holiday, we kept pinching ourselves because it was almost too good to be true! It exceeded our expectations and will always have fond memories of Sri Lanka, especially of the beautiful elephants and Buddhas! 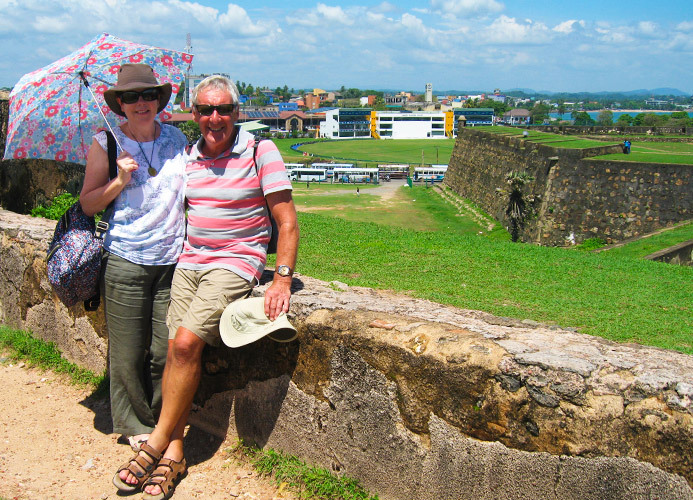 I imagine it is a country that is going to change a lot in the near future, due to influence from tourism and from other countries, so I am pleased we visited when we did and saw some of the most authentic sides of Sri Lanka. We loved how the two parts of the holiday complemented each other and gave us a taste of both culture and luxury and we are now looking forward to planning our future travels! It is advisable to buy the local currency when you arrive, as it can be tricky to get hold of in the UK. Be sure to get lots of smaller notes so you can tip, as there is a big tipping culture in Sri Lanka. We are so glad we upgraded to the luxury hotels. Not only did we get to stay in an iconic over-the-water villa in the Maldives, but we also got treated to special dinners and even a massage! The sun can be very strong and when you’re out and about you need to protect your head from the sun. The Maldives is a tropical island nation, made up of 26 ring-shaped atolls, which contain a total of 1,000 coral islands. It is a favourite honeymoon destination and also very popular with marine-life enthusiasts due to its extremely abundant sea life, making it the perfect place to snorkel or dive.